This chapter was unique to the series, since we finally got to witness how Kenny Powers handles wealth, and as you would imagine, all that was missing was a baby giraffe for him to kiss. Kenny Powers’ ego and his financial irresponsibility almost always lead to his undoing, and with only three episodes remaining, that should be happening very soon. 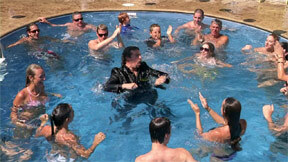 “I did this.” Kenny Powers made the luxurious swimming pool all possible, which is why the pool party was a tribute to him, and his ability to swim in $5K suits. April was right to think Kenny is being obnoxious with money, and has lost touch with reality. She wants them to attend couples counseling, but he just ignores her. Even though Kenny followed through on his commitment to charity, he makes everything about him — “I, I, I” in a speech, calling himself a “handsome white Jesus” to the children. Sports Sesh now has a sub-segment called “Kenny’s Cuttin’ In”, where he interrupts the show for more camera time. As we later learn, he cuts in every episode. Kenny admitted he’s not good at making up, so instead he tried to buy off Dustin and his family‘s love with gifts (assault rifle for Dustin Jr, a guitar and amp for Wayne, and a crystal decanter for the girl named after Titanic). Instead of solving their differences, Kenny made it rain, literally throwing his money in their face. As Guy Young explained it, his jet pack system is a perfect analogy for the way Kenny Powers manages finances. He cannot afford it, or didn’t earn it, but Kenny’s going to get one anyway. After Guy Young asserted his role as star of Sports Sesh, Kenny watches a movie where somebody is thrown off a ridiculously tall cliff. Which alpha male was being symbolized there — Kenny or Guy? Kenny Powers might be “shittin’ gold” right now, but he’s still confused why everyone keeps telling him to slow down, instead of sitting back and enjoying the show. (the Kenny Powers show). Stevie fears Kenny will ruin things by not heeding Guy Young’s warning, but Kenny refuses to be relegated to the Scottie Pippen role, cause he’s Michael Jordan. Kenny takes April out to a lavish crab dinner, where he keeps flashing money around, gifting April a $3K Chanel purse with a Kindle and $500 cash inside. Several references to Scarface (another story of epic collapse due to ego), including Kenny’s suit and gold coke spoon / fingernail. However the most ominous was the shot of Kenny looking into the pool — his empire. Kenny Powers proves over and over again, that he’s incapable of knowing when to leave well enough alone, “Cuttin’ In” on the Sesh one more time. Instead of meeting April for a counseling session, Kenny spends $250K on his own jet pack. The closing narration to the chapter also demonstrates that Kenny Powers views his family as an acceptable sacrifice to the betterment of his career. Throughout this chapter Stevie modeled a variety of fashions, most notably a tribute to Hunter S. Thompson. We have a pic of each outfit over in the photo gallery if you want to take a look. As pictured left, Stevie was floored by Kenny’s concept for T-N-T.
opening title, or baseball logo.